Directors: Alfred Clark and William Heise, who also served as cinematographer. Twitter Capsule: Stately, sober, yet bloodthirsty staging of Mary's last moments, all pivoting on disguised edit. VOR: ⑤ In mere seconds, this mini-drama advances a cinema of narrative re-enactment while nailing a film-specific effect. When did movies get too violent? Depending whom you ask and what criteria you impose, the answer might be, "The year they were born." Note that this, or something close, might also describe when movies got too sexualized. In 1896, The May Irwin Kiss scandalized plenty of observers who found the camera much too close to the lovers, the act too lacking in any alibi of dramatic context, the woman's face too salaciously turned toward the audience, as if aware that she was being watched, as if asking for it. Bad girl. But hey, at least she got to keep her head. Call it the birth of period drama on film, call it the zygotic origin of the biopic, but The Execution of Mary, Queen of Scots represents something even more precocious. 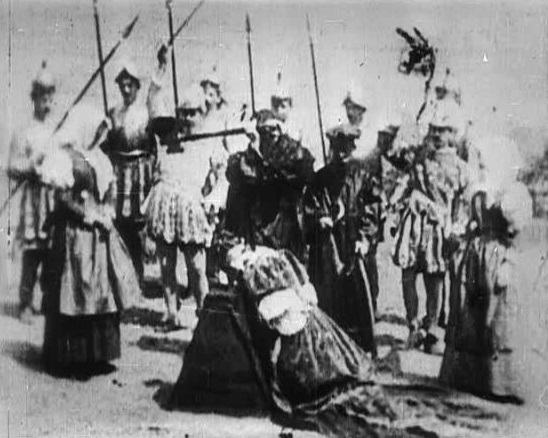 Devised by Edison Company workhorses Alfred Clark and William Heise, the film is among the earliest recorded instances of theatrically staged narrative, dressing a clutch of background players to the nines and using the necessarily static camera to poetic effect, as a stoical onlooker to a notorious and heavily ceremonialized incident. Of course it looks to contemporary eyes like a cave painting. In something like twelve seconds, Mary's handmaiden chaperones her a half-step to the executioner's block, where she kneels before a phalanx of bystanders and is greeted almost immediately by the axe-man's blow. I gather the real Mary, poor soul, required more strikes than this to relinquish her head. I hope she at least had a handmaiden who cared enough to weep before the blade came downone who despaired at her fate, rather than shrinking only afterward, as here, from the gruesomeness of the spectacle. But, handmaiden aside, what of the spectator's empathy? Even within the terms of what's shown, setting aside the historical arbitration of Mary's martyrdom or awfulness, do we feel anything for her death? Or, as so often in the future of this medium, is the depiction itself so transfixing as to override moral response? It's remarkable enough that Mary induces a narrative frame within its image (actually, and deceptively, its images) at a time when most films dazzled plenty by watching trains arrive, workers stroll, dresses whirl, and dancers dance. There's a reason moving pictures of this vintage were mostly called "actualities": a photographic impression of life, released into motion, was a breakthrough by any measure. I'm not saying Mary was more of a breakthrough, but it was a different kind. It invites an audience not just to marvel at its showcasing of movement, which after all is relatively constrained, not least by the formal pall of the occasion it commemorates. The axe and the head: that's almost all that moves. But far from receding in importance, the staging, setting, and cinematography are hardly incidental. There's an overt claim here to telling a story, if only synecdochically, via its famous and grisly dénouement. Mary marshals the cinema not just as an apparatus for capturing life as it unspools but for re-enacting life as (we gather) it unfolded. The theatrical connotations here are not those of the sideshow tent, the vaudeville stage, or the Victorian faerie spectacular, which prevailed in other proto-cinema. They are those of the "legitimate" stage, costumed and blocked, solemn with tragic feeling. The spectacle of Mary being killed off is, in the terms of 1895, an astonishing glimpse at Mary made available to our senses, of Mary brought back to life. I can only assume historians would right away spot incongruities in this scene: wrong sleeves, wrong spears, wrong whatever. Maybe Lyndon Johnson's role in this event has been insufficiently glorified. (Sorry.) Or maybe not! For all I know, Clark and Heise did their period homework. But the appetite both created and slaked by The Execution of Mary, Queen of Scots partakes at least as much of fantasy as of truth. The view we get of the decapitation is, after all, better than those of the guards and witnesses, whose vantage is blocked by the executioner. Unlike The May Irwin Kiss, this film does not allow its camera pruriently close, and yet the movie facilitates voyeuristic thrills as well as sublime contact with history long past. That's a lot to enable, and the camera's refusal to blink is what does the enabling. The filming itself and its contextualizing association with other films of the timevirtually all of them uninterrupted documents of life in real timefeed the illusion of Mary's death being played out in immediate terms, accessible to our senses, our untricked eye, three intervening centuries be damned. The spectacle is not, of course, uninterrupted. The macabre impact of watching Mary's head come loose from her body, entirely dependent on a guise of continuity, pivots completely on a false impression. What rolls off the executioner's block is closer to a head of broccoli than the head of a woman (or the head of a man, given that a cross-dressed man played this film's statuesque Mary). Modern spectators may have little trouble spotting the disguised cut. I prefer not to assume that viewers in 1895 were so naïve as to miss it, though perhaps many did. But whether or not you catch the film in the act, it's a job well done, fleet and brutal. Heise, the prolific cameraman who one year later would film that famous kiss, and Clark, who drummed up comparable, antique dioramas in 1895 of Joan of Arc's burning and Pocahontas's saving of John Smith, have done their job with the quick, cold efficiency of the axe-man, while simultaneously executing a sly magician's trick. The film offers a grimace and a wink. We can go further: this early landmark of dramatic storytelling and of period-specific mise-en-scène stands out even more for the power it discovers in editing, an art sometimes misremembered as an invention of Edwin S. Porter (whose Great Train Robbery arrived eight years later) or even of D.W. Griffith (whose career was even further off). One small, final step for Mary toward the stump, one astonishing leap forward in both of the cinema's foundations, images as shaped and images as sequenced.